Don Tudor | Galion Inquirer The Galion Lady Tigers Gabby Kaple had quite a game for the home team on Thursday, April 19 against the visiting Clear Fork Lady Colts. Kaple finished with a single, a double, two runs scored and a stolen base in the Tigers 6-3 victory. 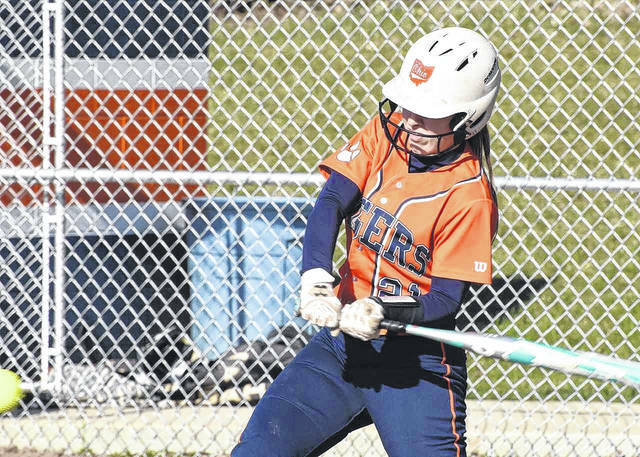 GALION — After being defeated on the road on Wednesday, April 18, the Galion Lady Tigers played host to the Clear Fork Lady Colts in the finale of their season series. The Tigers defense and starting pitcher Madelyn Thomas would set the Colts down in order to begin the game. In the bottom of the first, Gabby Kaple stepped into the batter’s box and ripped the game’s first hit, a single, to the left side of the infield. A throwing error by Clear Fork third baseman Haylie Miller would put Kaple all the way at third where she would score shortly after following a wild pitch by Colts’ pitcher Maddy Wine. In the second inning, Whitney Snavely would belt a double for Clear Fork’s first hit and would proceed to steal third. Hallie Gottfried would walk and steal second to put two runners in scoring position but that’s where they’d stay after Brooke Robinson struck out to end the inning. Galion would get a pair of singles from Thomas and Kayden Caudill but Wine picked up her third strikeout of the inning to end the Lady Tigers’ threat. Kaitlin Wuertz struck out to begin the visiting half of the third, followed by a Carson Crowner walk. Two stolen bases later and Crowner was at third base with just one out. Zara Thomas would flyout to right and Crowner tagged up to put the Colts on the board. Kaple would lead-off the home half of the third with a double, followed by a steal of third before Kate Schieber drove her in on a fielder’s choice to Wuertz at second. Heading into the fourth, Clear Fork found themselves trailing 2-1. Despite singles by Snavely and Gottfried and a steal by Gottfried, the Lady Colts would eventually strand runners at second and third base for the second time in the game. Thomas ripped a triple and would later score for Galion on a Caudill fielder’s choice to expand the home team’s lead to 3-1 entering the fifth. A single for Wuertz and a single and a steal for Thomas once again put Colts baserunners in scoring position and that would be where they stayed after a Miller flyout to second and a groundout to third by Courtney Palmer closed out the top of the fifth. Galion would go in order in the bottom of the frame and Wine earned two more strikeouts for the visitors. Clear Fork would go down in similar fashion in the sixth, still trailing 3-1. Galion would net some insurance runs in the bottom of the sixth. Nevaeh Clark singled to begin the rally, followed by an Emily Sedmak walk. Gracie Groves stepped in and laid down a perfectly executed bunt. Gottfried, now behind the plate for Clear Fork, overthrew first baseman Z. Thomas, leading to Clark and Sedmak scoring runs and Groves moving all the way over to third. M. Thomas would then drive Groves in on a sacrifice fly to center field. Down to potentially their final three outs, the Clear Fork seventh began with pinch hitter Reagan Marshall. Marshall would single and later score, along with Crowner who reached on an error, on a double by Miller. Palmer would flyout to Maddie Harmon in right field to end the game and strand Miller at second as Galion won by a final of 6-3. The win moves Galion to 7-2 overall on the season and 3-2 in the Mid-Ohio Athletic Conference. Clear Fork drops to 10-3 on the season and 2-3 in the league with the loss. Thomas earned the win in the circle for the Lady Tigers, throwing all seven innings and allowing the three runs on eight hits while walking two batters and striking out eight. The defense behind Thomas committed just one error on the day. At the dish, Thomas helped her cause with a single, a triple, a run scored and a run batted in. Wine took the loss for the Lady Colts despite allowing just six hits en route to the six runs. Wine walked just one Galion hitter and struck out seven in the six innings. Three costly errors in the field, two of which led to three Lady Tigers runs in the sixth inning, were committed by Clear Fork on the day. Offensive stats for Galion on Thursday were: Team- 6 runs, 6 hits, 3 left on base (1 in scoring position); Kaple- 1B, 2B, 2R, SB; Schieber- RBI; Clark- 1B, R; Sedmak- R; Groves- R; Thomas- 1B, 3B, R, RBI and Caudill- 1B, RBI. Offensive stats for Clear Fork were: Team- 3 runs, 8 hits, 7 left on base (all in scoring position); Crowner- 2R, 2SB; Thomas- 2-1B, RBI, SB; Miller- 2B, 2RBI; Snavely- 1B, 2B, SB; Gottfried- 1B, 2SB; Marshall- 1B, R and Wuertz- 1B. Both teams will be in conference action on Friday, April 20 with the Tigers at Pleasant and the Colts hosting Buckeye Valley. On Monday, April 23, Galion will head to Mansfield Christian and Clear Fork to Northwestern, both non-league contests. The Lady Tigers will be on the road at North Union on Tuesday and host the Lady Wildcats at Klehm Field on Wednesday, April 25. Clear Fork will host the Ontario Lady Warriors on Tuesday before traveling to Ontario for game two on Wednesday. These two teams also met on Wednesday, April 18 with the Colts hosting and defeating the Galion Lady Tigers by a final score of 8-3.
https://www.galioninquirer.com/wp-content/uploads/sites/38/2018/04/web1_Gabby-Kaple.jpgDon Tudor | Galion Inquirer The Galion Lady Tigers Gabby Kaple had quite a game for the home team on Thursday, April 19 against the visiting Clear Fork Lady Colts. Kaple finished with a single, a double, two runs scored and a stolen base in the Tigers 6-3 victory.